What size should you make your custom trade show exhibit? Does bigger really mean better, and in turn, more results? In fact, size does matter in terms of making an impact in an exhibition hall. But, there are a number of other factors that come into play. Trade show expert and author Steve Miller notes that the magnitude of your trade show exhibit will, indeed, impact whether people see it, stop in and remember it. Of course, a 10,000 square foot mega-booth will get a lot more attention than a little 100 square-footer. Yet in his book, How to Design a Wow Trade Show Booth Without Spending a Fortune, Miller points out that most companies are not in the position to spend six figures on the design of a custom trade show exhibit and certainly may not need to make that type of marketing investment considering their goals. Following are some guidelines for determining space needs for your trade show display area. Select a few of your top products for your booth, based on those you want to aggressively promote. This will enable you to display and sell more effectively versus diluting your impact with a wide variety of products that require multiple messages and selling strategies. Based on the products you choose, determine how much space you will need to adequately showcase them in your booth. Identify other space requirements for your custom trade show exhibit, such as computer stations, kiosks, tables, and other accessories needed to promote your products and meet with visitors. Consider that actual size of banners, signage, and other display components. Allow for 50 square feet of space for each staffer working your booth. The number of representatives per shift should be determined by how many visitors you forecast to stop by your booth. You can make an estimated count by looking at the size of the event and your promotional activity before and during the show. 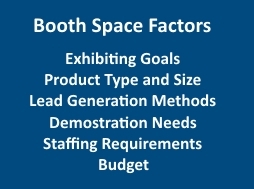 Another way of defining staffing space is to allocate about 30% of your booth area for your representatives. Review your event budget and realistically calculate how much you can afford to spend on your booth space. Remember to look at your goals for the show in terms of leads generated and sales to calculate a return on your investment. Your final step in determining size and space for your trade show exhibit is to examine each of the above factors and calculate your total space needs relative to available funds. For more information, please see the articles below.